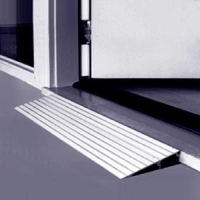 This EZ-Access Threshold Ramp comes in a variety of sizes to fit up to a 6' threshold. This ramp is is perfect transition to getting in and out of the home or office with a scooter or wheelchair. 1" Product Weight: 3 lbs. 1.5" Product Weight: 5 lbs. 2" Product Weight: 5.5 lbs. 3" Product Weight: 8 lbs. 4" Product Weight: 11 lbs. 5" Product Weight: 15 lbs. 6" Product Weight: 20 lbs.